After months and months of anticipation, it’s finally here. It’s our time! We get to sew, to make quilts, to sew, to create neat stitchy-stuff, to sew, to have fun, to sew with friends, etc. Okay, so I hope you’re doing that every month but this month is extra-special. If someone asks if we’re “sewing again?”, we get to reply that we’re celebrating an important national event! Betsy Ross? Without her, there wouldn’t be a Flag Day and the 4th of July… I rest my case. So stock up on ready-to-eat meals, lay in a supply of your “sewing snack” of choice and pull out a new package of rotary cutting blades because it’s National Sewing Month! Zippers. Make sure to stock up on zippers… okay, maybe that’s just me. Help me. I can’t stop making zipper bags. 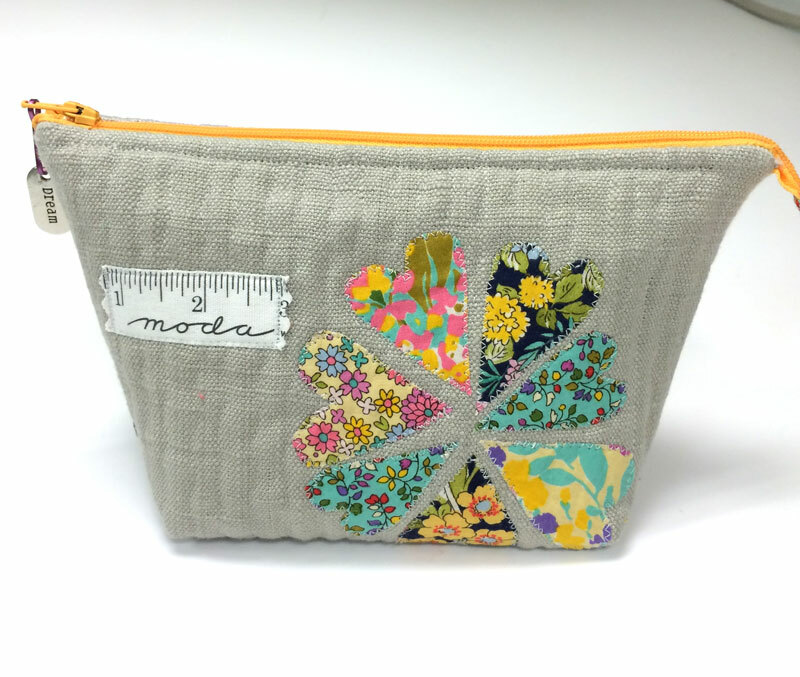 This was made using scraps – literally! – from the cuttings left after making the headers/cap-sets for the sales reps. The prints are from the “coming soon” Regent Street 2015 Lawns collection and the base-fabric is the new Barkcloth. It’s a little thicker than the Mochi Linen but it is so dreamy-soft – I’m looking forward to playing sewing with this for other projects. 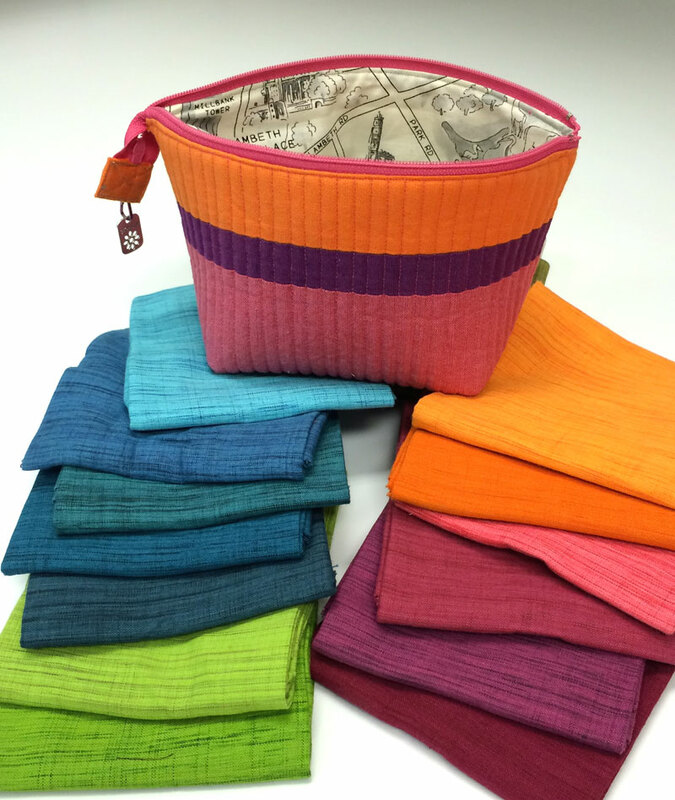 The bag pattern is the Wide Open Zipper Bag by Anna Graham – Noodlehead. 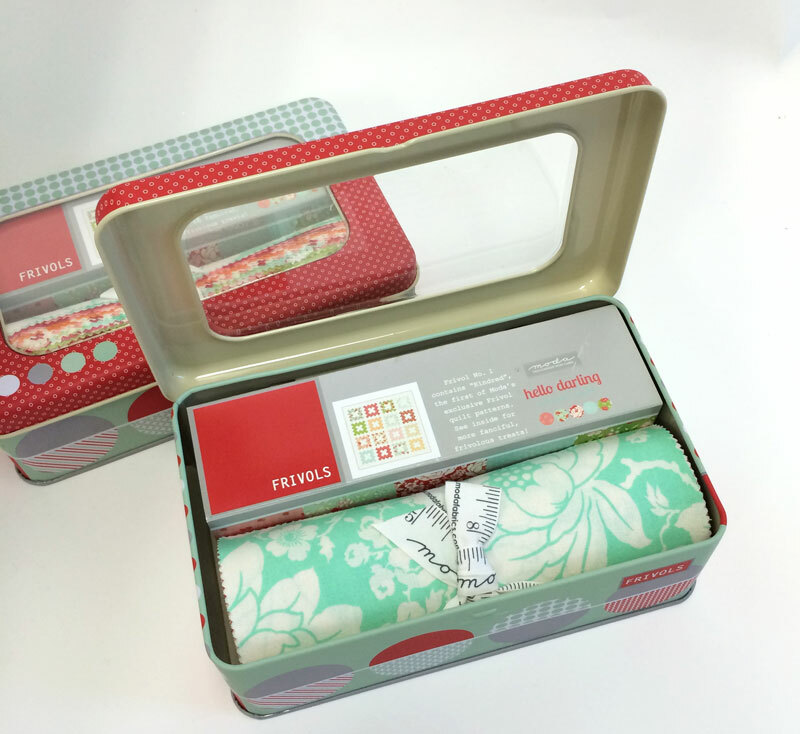 The first Frivol is with Hello Darling by Bonnie & Camille. You knew that, right? The title of this quilt is Kindred. This was one of the blocks I drew up before we knew what the fabric collections would be. When Hello Darling was chosen, I knew this would fit the fabrics well, and I liked the association of an Album Block with Bonnie and Camille. The block is associated with family, friendship and community, and that’s them, Moda’s first mother-daughter design duo. 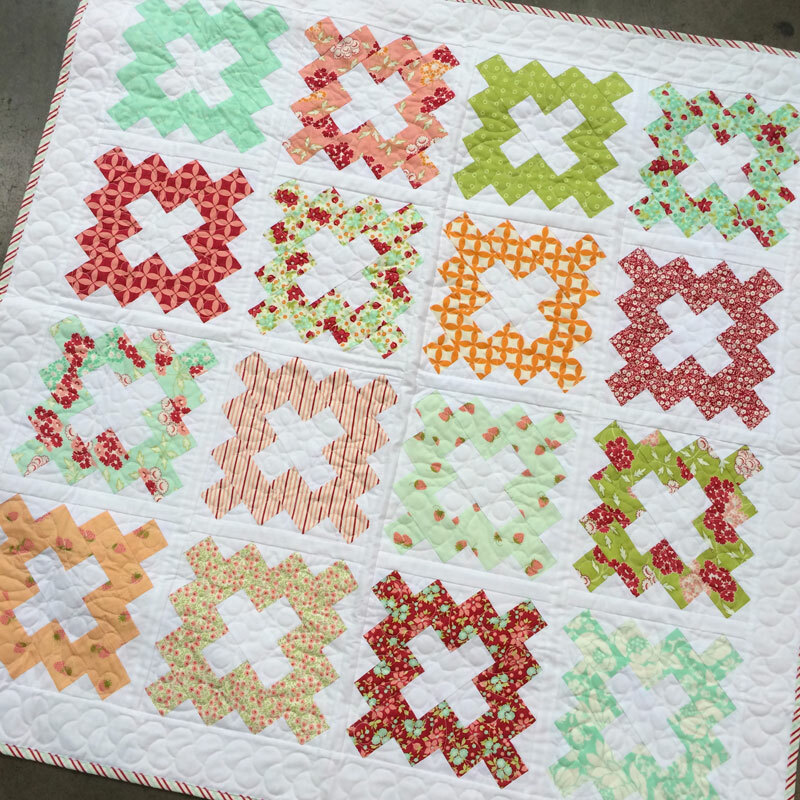 I also knew that the block was one of Camille’s favorites, she had used it for Vintage, a quilt in her best-selling book, Simply Retro. So while this was in the planning stages, I asked if she had any objections to our using this block for this quilt. I don’t recall the exact reply but it was something to the effect of “I didn’t invent the block… it’s in every block book… are you kidding?”. 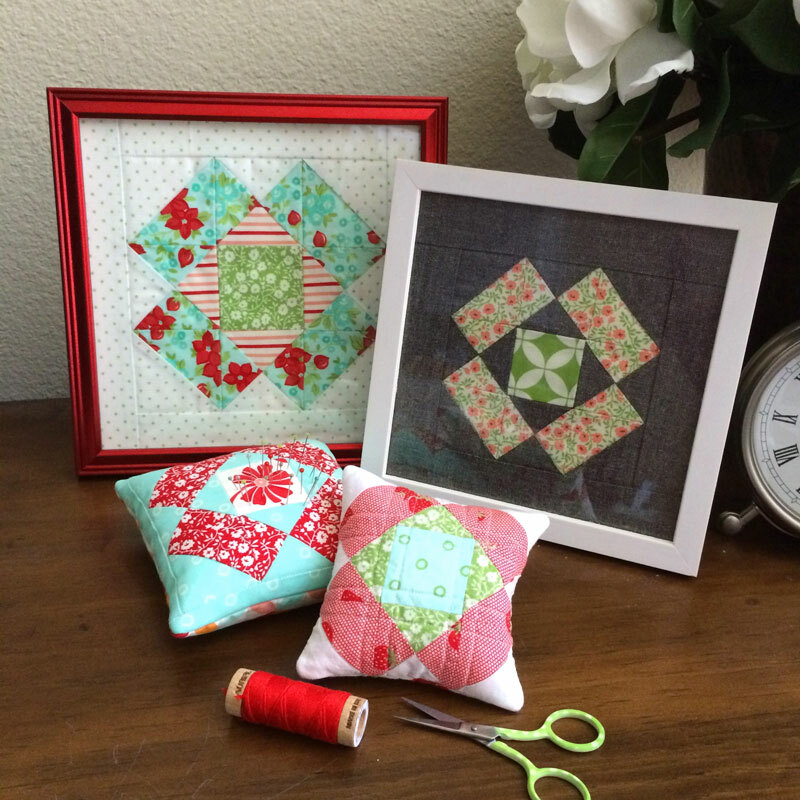 The block is relatively easy to piece – it’s just squares, rectangles and setting triangles. The only thing that will mess anybody up is seam allowance – this is one of those blocks where accuracy matters. There is one important thing to mention about the block and pattern – a discrepancy that is the result of a new pattern-writing process for many of us. The numbers in the pattern are correct but there is still an error. In the Kindred pattern, the setting squares are cut at 3 1/4″ x 3 1/4″, and it states that the squares are cut over-sized to allow for trimming. Trimming instructions are provided. The 3 1/4″ x 3 1/4″ size is for true-to-size piecing. With accurate – perfect – cutting, seam allowance and pressing, the blocks will measure exactly 9″ x 9″. Only the four corners will need to be trimmed. As originally written, those squares were to be cut at 3 1/2″ x 3 1/2″, and the yardage is calculated for cutting the strips and squares to that size. During the technical editing process, the numbers were changed to the exact-piecing size. That wouldn’t be a problem except that the pattern says the squares are over-sized. So I goofed. When I did one of the final proofs of the pattern, I should have compared the pattern to my original notes. The “new” numbers are correct but the pattern is misleading… so it’s wrong. And I’m sorry for that. If there is an upside, it’s that we’ve gone over our process to ensure that we get better. The next three “finished” Frivols patterns have been re-read, re-proofed and re-tested. So if you haven’t cut out your background squares yet – where it has you cutting 3 1/4″ strips and squares, make that 3 1/2″. I did make a couple of the Maker blocks – enough to make something cute to use right away. The block instructions are on the really cute quote/block cards included the Frivol. We asked the designers of the fabric collections to send us one of their favorite quotes, and it’s been a lot of fun to learn a little bit about them by reading their selections. 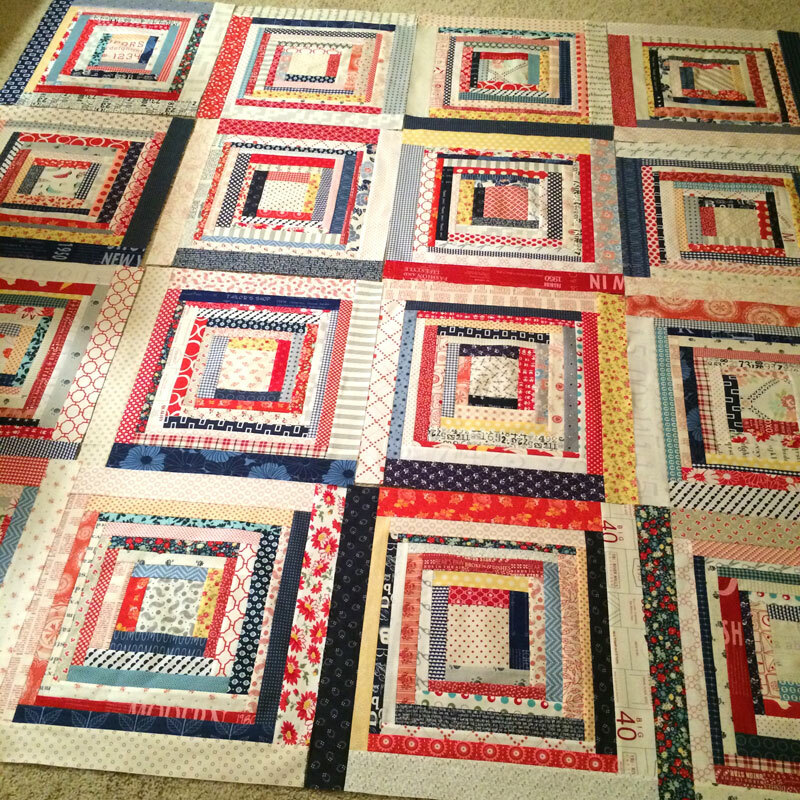 We’re posting blocks and quilts to Instagram and Facebook using the #modafrivols tag. Yes, making more blocks is on my “to do list” for September. I am hoping to make a small sampler quilt using one of each block… and another larger quilt using multiples of each block – the same block, just made differently to make them look like different blocks. And both sizes – yes, I’m making both sizes of blocks. At least that’s my plan… we’ll see how that goes. And more of these. Really. I’m obsessed. These are the Moda Crossweaves – the textures. (The 12120 SKUs instead of the 12119s.) And another Open Wide bag. I’m also going to try to finish my Log Cabin Swap quilt. Did I ever show you my blocks? This picture was taken before the blocks were cut into quarters and swapped. So what are you going to sew this month? I look forward to hearing from you … your Frivols sound like fun! What a timely post, as I was going to work on my #1 Frivols a few days ago, but got delayed. Fate!! LOL Thank you for the correction. What am I going to sew in September? Are you kidding: Well, where do I begin? September has always been my “time to make a Christmas Projects List” month. I think it might have to do with the kids going back to school, etc., although now I have grandchildren that are going back to school. Not living with me, but you get the picture. I have 5 Christmas quilt WIP’s; not to mention these WIP’s: a set of 12 Christmas placemats and a fabric basket to hold them; a flannel Miss Kate quilt to finish; about a gazillion zippered pouches, some pincushions, some quilted tote bags, and this is in addition to 1)rebinding an old quilt, 2)finishing up a hand quilted charm quilt, 3) and more projects too numerous to mention. Of course I won’t get all these done, mind you, but these are what I have to play with for the next 4 months (actually minus 5 days). Sorry this post is so long. But, you did ask what we would be sewing…………………….. I am so excited! 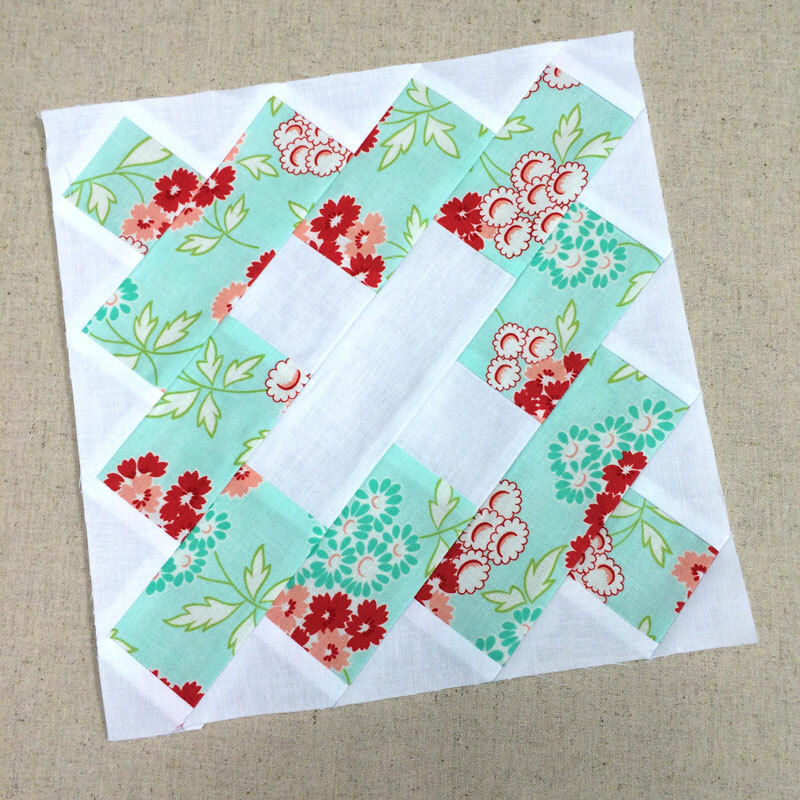 At the end of the month I am taking 2 classes at Alden Lane Quilt in the Garden. Freddie Moran and Alex Anderson! Did I say I was excited? Before that I am going to work on Lucy! Fabric all starched and pressed, now to cut and sew. And a few craft sewing projects, pennants for my granddaughter’s rooms and a Bendy Bag or two…Christmas is coming! I enjoyed reading your post! 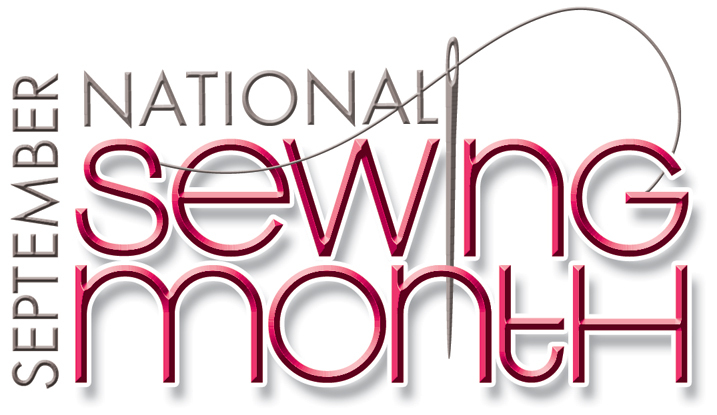 Thank you for the information on National Sewing Month, I had no clue about the history behind it and found it fascinating. Your bag is great, I have an obsession of NOT putting in zippers. LOL. But I am getting better at them. Great to know about the piecing accurately with the block. I have to many other projects going on right now, but have book marked this post to hopefully get to soon. I think it would be the perfect block to make a quilt for a family reunion coming up. Thanks for sharing everything and have a wonderful creative day! I enjoy reading your posts.I have many projects to play with and UFO`s.You made gorgeous projects! So many new goodies!!! I love them all! I finished my First Frivol at a quilt retreat with my small group ! But I also decided it needed a nice border so I got two charm packs at my LQS for a nice piano key border. I didn’t have any issues with the pattern so no worry on the pattern. Lots so sewing on my September list, finish My Small World by Jen Kingwell and then the border for the Frivol. Cannot wait for the next Frivol to arrive! Love reading your posts! Keep them coming!!! ha ha. My husband will be discouraged about this news. I think he feels like EVERY MONTH is sewing month! Ignorant question . . . The term “frivols” doesn’t show up in Wiki. Is it related to “schibbles”? or does it have something to do with that cute metal box I keep seeing. Who makes it? one person or moda in general? I seem to be missing the party. See you in Houston!!! Hi Carrie, thought of you today for reasons other than quilts or fabric. I am so glad all is well with you, and that your new life is bringing you much joy.